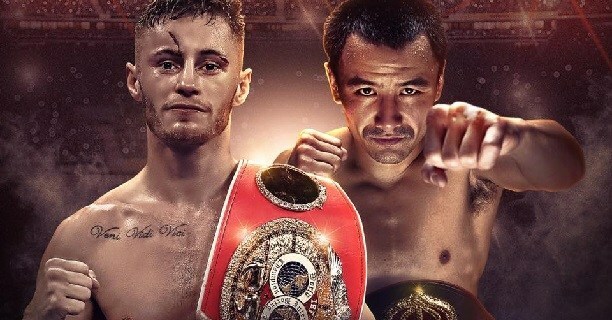 Zhanat Zhakiyanov believes he’s got the bigger heart in his clash unification clash with Ryan Burnett at the SSE Arena in Belfast on October 21, and that will see him add Burnett’s IBF Bantamweight crown to his WBA Super title live on Sky Sports and HBO. Zhakiyanov climbed off the canvas twice in the opening round in Ohio against Rau’shee Warren in February, but pulled away from the champion to rip his title away via split decision. The Kazakh enters hostile territory once again in Belfast as he looks to repeat that feat against Burnett, who defends his belt for the first time since claiming it from Lee Haskins in June with a dominant display. The pair are familiar having sparred when Burnett was beginning his career, and while Zhakiyanov was impressed by Burnett’s win over Haskins, the 35 year old believes his experience and CV shows he’s going to be able to dig deeper and claim both titles next weekend. “Ryan was a young pro at the time we sparred and has developed into a worthy champion,” said Zhakiyanov. “However, he needs to understand that I have also developed and travelled around the world fighting better opposition. “I travelled to the U.S to beat Rau’shee Warren in his home town where I went down early and pulled myself off the canvas. I don’t know if Ryan has that experience and heart that I have. “You have to congratulate Ryan on a good victory over an awkward opponent back in June to win the IBF title, but my style is different to Haskins. Zhakiyanov’s clash with Burnett tops a huge night of boxing in Belfast as Paul Hyland Jnr defends his IBF European Lightweight title against Stephen Ormond and James Tennyson puts his WBA International Super-Featherweight title against Darren Traynor. Burnett’s Adam Booth gym mate Josh Kelly fights for the fourth time in the paid ranks, as is his Team GB Rio Olympic teammate Anthony Fowler. A host of local and Irish talents appear on the bill with Cruiserweight Tommy McCarthy, Super-Lightweight Tyrone McKenna, Lightweights Joe Fitzpatrick and Gary Cully and Super-Featherweight Feargal McCrory. Face value tickets for October 21 are also be available from http://www.stubhub.co.uk/matchroom-boxing-tickets/ . StubHub is the official ticket partner and marketplace of Matchroom Boxing and Anthony Joshua.